While state capitol regulars may be most familiar with the nonpartisan Legislative Council Staff (LCS) for its hardworking crew who staff legislative committees, constituents are more likely to interact with LCS’s constituent services staff who assist legislators in responding to constituent questions, concerns, and requests for information, and their public relations team, Visitor Services. Housed on the ground floor of the capitol building, Visitor Services specializes in making the Colorado legislature approachable for the general public, welcoming visitors from as far away as Australia and as close as Cap Hill through their public tour programming. With approximately 70,000 people taking official tours each year, Visitor Services’ docents offer an insider’s look at the architecture and history of one of the most memorable public buildings in the state. Recently I had the opportunity to connect with the Visitor Services’ Assistant Manager, Erika Osterberg, and pick her brain about the many ways the capitol tour serves as a bridge between the legislature and the public they are committed to serving. Below you’ll find our conversation, edited for length and clarity. How does the capitol tour help LCS fulfill its mission? Our mission is to inspire and educate the public about our historic statehouse and the work of our General Assembly. 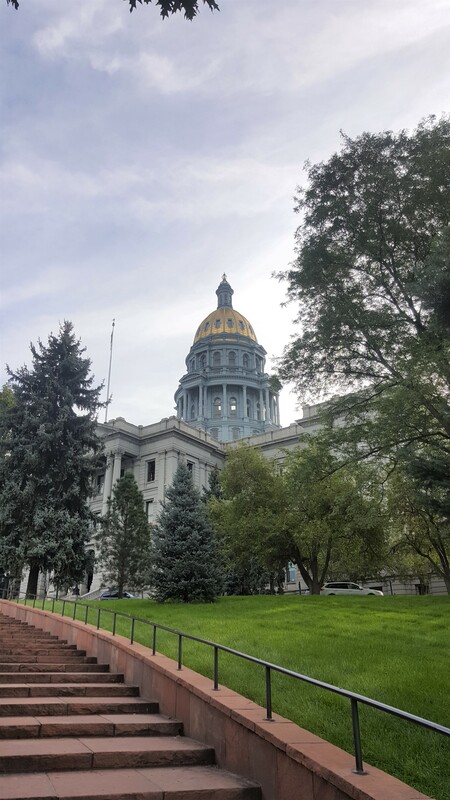 While our work is a bit different than that of our colleagues in LCS, we share a deep pride and commitment to service as ambassadors to the capitol and the state of Colorado. Providing accurate, nonpartisan, and unbiased information in a professional manner is a responsibility we take very seriously and something we require each guide to honor. What does a typical tour look like, and what elements of the tour are unique to Colorado? Our public tours last about one hour and include a brief historical overview of our state; information about the architecture, construction, and materials that make up the capitol; capitol artwork; and the legislative process. All public tours also offer an opportunity for visitors to make a trip up to the dome observation area to enjoy our incredible 360-degree view of the Front Range, downtown Denver, and the plains to the east. For groups with reservations, we offer this tour by default but can also build into their schedule a docent-led tour of Mr. Brown’s Attic Museum. Additionally, during the legislative session, we help coordinate a “legislative tour,” where groups can spend time observing work on the floor and learn in greater detail about the work of the General Assembly. These tours are primarily designed for student groups, and Visitor Services leads these tours alongside staff from House and Senate Services. We have a very gifted team of guides comprised of volunteers and part-time work-study students from the University of Colorado at Denver and Metropolitan State University of Denver, as well as five full-time temporary college student “summer guides” who work from May-August and whose enthusiasm and love for this building is extraordinary. We see and hear many wonderful compliments about our knowledgeable and friendly staff who bring this building to life for so many visitors. While in many ways the beauty of this building speaks for itself, touring with a guide gives one a deeper appreciation of the history and impact of the capitol and the work that happens here. Why do you think offering this tour to the public matters? In addition to educating the public about the rich history and heritage of Colorado, we recognize our unique opportunity in helping them better understand the legislative process and the importance of public participation in state government. Many visitors—both local and international— are surprised to learn that the public is welcome to observe work on the floor or that they may testify in committee, for example. We see it as an important responsibility to demystify work that some people find intimidating in its complexity. Ms. Osterberg’s insights into Visitor Services’ tour programming highlight the long-term value of welcoming people from all walks of life to the capitol. Opportunities to witness the House of Representatives or Senate in action from the galleries of their respective chambers and to stroll through the hallowed halls of this historic building may make visitors feel more invested in following the state legislative process because of their newly informed connection to this physical landmark that represents Colorado and its citizens. Free public tours start on the first floor of the capitol and occur Monday through Friday, on the hour every hour between 10 a.m. and 3 p.m. Groups with fewer than 10 members may join these tours and should arrive at least 20 minutes early because the tours are popular and often reach the 30-person limit before the tour begins. If visiting with more than 10 people, be sure to make a reservation via Visitor Services’ online booking form. These reservations can be made up to one calendar year in advance. For those who are unable to participate in an official tour of the building, the Capitol Building Advisory Committee, in conjunction with LCS’s Visitor Services, is currently working through a proposal to develop an audio tour that visitors can complete at their own pace. For more information about this proposed audio tour option, contact Visitor Services.